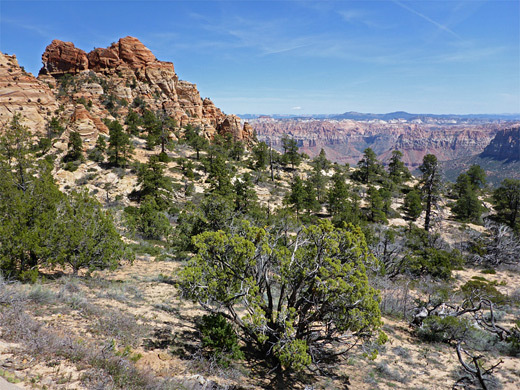 The Eagle Crags are a group of Navajo sandstone pinnacles at the end of a narrow ridge, part of the Vermilion Cliffs, that extends north from the generally flat top of Lower Mountain, which forms part of an extensive, elevated plateau on the south side of Zion National Park. 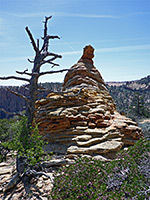 Most of the southern section is occupied by the slightly higher, and wider, Canaan Mountain, and all of this area is characterized by a great variety of eroded formations of the light-colored, cross-bedded sandstone, a landscape further enhanced by small streams and scattered groves of ponderosa pine trees; photogenic scenery, though not so easy to reach. The most used approach is from the south, starting at Colorado City, ascending via the pretty narrows of Water Canyon, but the crags provide an alternative access from the north. 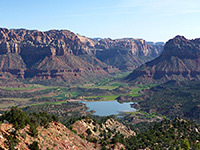 A two mile, semi-maintained trail crosses the bushy slopes below, ending at an overlook that has fine views over the East Fork Virgin River and the cliffs of Zion Canyon, then an unofficial, increasingly strenuous and lesser-used route continues climbing over steeper, rougher terrain to the rim of Lower Mountain, beyond which the land is fairly flat and walking becomes much easier. From here, the highest elevation areas, on top of Canaan Mountain, start another 2 miles south, but to explore some of this region would need at least one overnight stay, however a trip just to the north edge of Lower Mountain, perhaps continuing a short distance to the western rim, makes a fine day hike, between 10 and 12 miles round trip, taking from six hours or more. Eagle Crags and Lower Mountain topographic map. 18 views along the trail. 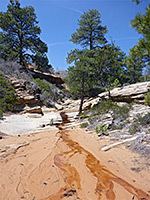 All of the route is just outside Zion National Park, on BLM land southwest of Rockville on Highway 9. The unsigned trailhead is reached by driving south along Bridge Road, over the historic bridge across the Virgin River then continuing straight on at a junction, an unpaved road that climbs steeply up the side of a mesa, passes through a dispersed residential area and ascends some more, exiting the private land shortly before the trailhead. The latter stages of the road are liable to be bumpy and rutted, and one steep part generally requires at least a HCV. Many 'Private', 'No Trespassing' and 'No Camping' notices indicate that parking is not permitted anywhere else along the track, so for people with large or low clearance vehicles, the hike has to begin below the mesa, from a parking area near the junction by the river, 1.4 miles from the trailhead, which has a map, restroom and space for about a dozen vehicles. The vehicle track continues north a way, to a viewpoint at the edge of the plateau, overlooking the junction of the east and north forks of the Virgin River, while the trail departs to the southeast, initially descending gently to a dry wash, curving across the valley then rising steadily up an overgrown slope, where the pinyon and juniper trees mingle with cacti, yucca and many spring wildflowers, the most visible species being bajada lupine, wallflower and several types of astragalus and cryptantha. A few other tiny drainages wind through the woods, before a sign and aged fence that mark the boundary of the Canaan Mountain Wilderness Area. 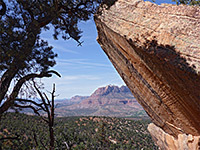 More climbing is followed by a flatter section and a couple more, larger, dry washes, while the views remain generally limited; sometimes the crags are visible up ahead, or the cliffs of Zion to the north, but most of the surroundings are thickly wooded. The land is usually dry, with just a few moister patches sustaining denser clusters of plants. The final section of the path is steeper, rising to a ridge, and ending with a few switchbacks, leading to a viewpoint just beyond a huge sloping slab of sandstone. 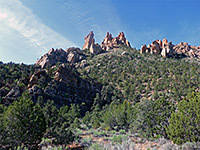 The crags are close by, though still over 500 feet above, while to the north is a grand vista over the East Fork Virgin River valley (the mouth of Parunuweap Canyon), and the tributary of South Creek, which is dammed at one point to form a reservoir. The viewpoint is not marked as being the end of the official trail, and the continuation path is at first just as well used, heading due south over exposed, sandy slopes, soon descending into the first of around ten ravines that must be crossed. Beyond is a more level section, up to around the 3.5 mile mark, before the gradient increases again, interrupted by a short descent into another gully. 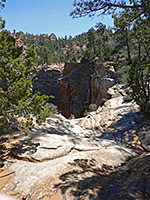 The third ravine is larger, with several distinct channels, followed by a prominent brow, past which the rim of Lower Mountain is properly viewed for the first time, at the head of a deep, narrowing canyon leading to a sheer fall, sometimes with a stream flowing over. The path, now faint and narrow, continues across several more big, steep-sided ravines, as the land becomes more generally steep. All of the route is marked by cairns, though the way ahead is not always obvious. After the final descent into a drainage, close to a prominent spire, the trail commences a long climb up a sandy slope to the base of the sheer cliffs that form the uppermost level of the mesa, followed by shorter ascents between level traverses, ending with a scramble up a narrow, sheer-walled chute below a distinctive notch (seen from some way below), up to a sandy flat, 300 feet below the jagged ridgeline that extends north to the Eagle Crags. All around are extravagantly layered and eroded sandstone formations including domes, cones and hoodoos, in many subtle shades of color. The cairns continue a little way, marking a suggested route south, then seem to stop, as the way ahead becomes obvious; they are most necessary near the top of the climb as there are many apparent choices as to the exact route. A third of a mile south of the top of the ascent, the land opens out and slopes down by 200 feet to a sparsely wooded flat, centered on a tiny stream lined by taller pines, with sandy, whitish mounds and slopes in all directions. 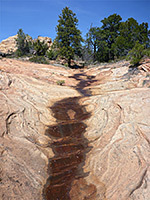 The creek can be followed back north to the drop-off at the plateau rim, beside a small spring surrounded by tiny wildflowers. To the east is another ridge topped by domes and split by gullies, so the logical continuation route is south, towards the less steep slopes along the edge of Canaan Mountain, perhaps first heading across to the west side of Lower Mountain, at the brink of the sheer drop to Horse Valley; from here the views extend many miles, to the distant Pine Valley Mountains. The flat land between the rims is crossed by several other streams, and seeps, all containing dark brown water, and sustaining patches of more unusual wildflowers including short-sepal bitterroot and slender woodland star.